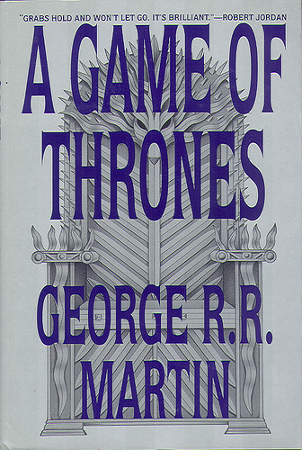 Despite the formidable length of George R. R. Martin’s A Game of Thrones, the book is mostly a set-up for the sequel. It’s no surprise that Martin’s intended trilogy ballooned into a seven-book extravaganza — focus isn’t his strong suit. I’m not sure if I will continue in the series. It might be best to hold off for now since Martin is fond of big gaps (up to six years) between books. There are so many story lines, characters, and plot twists that I’d want to reread the series before each new book and it’s just not good enough that I’d relish the thought of rereading for the sixth book, and again for the seventh. In short, the focus of the book is the power struggle over the Seven Kingdoms of Westeros told through a variety of viewpoints. The Starks of Winterfell are pulled south into a political tangle with the Lannisters. The daughter of a deposed king is gathering an army. Behind a mammoth wall of ice to the north, the Others are stirring. And a ferociously long winter is coming. There are loads of positive things I could say, but just as many negatives. I could build a case for a rave review as easily as a middling one. I’m in a good mood, so let’s start with the positives. -Not typical fantasy. Magic takes a back stage and is largely relegated to the past. It is not used as a get-out-of-trouble card by an irritatingly virtuous main character. -Influenced by the Wars of the Roses and the Hundred Years’ War, there’s a nice historical ring to the story, a sort of legitimacy that is lacking in most fantasy. Additionally, Martin’s world seems as dirty and rat-infested as the Middle Ages probably were. There’s no romanticism or silliness. The absence of [most] magic adds to this. -Decent writing. Strong enough to carry the story and balance the multitude of viewpoints. Each chapter is told from the perspective of a different character. This allows a situation to be viewed from multiple angles and motives. -Jon Snow. If it wasn’t for Jon Snow’s sections, I don’t know that I would continue reading. -The story isn’t terribly focused. The reader is treated to too many perspectives for the writing to be lean. Subplots everywhere. At times, this book seems like an Encyclopedia of Everything Happening Everywhere. Arguably, it’s all important, but Martin doesn’t roll out the story in a controlled way; it feels like he’s spinning the tale in front of you instead of handing over something tailored and edited. -There are an awful lot of unlikable characters. A lot of reviewers treat this surplus of rats as a testament to Martin’s ‘originality’, but there are times the book seems poorly balanced. Sure, the good guys can’t always win or survive the day, but success should seem attainable. They frequently lose because their virtue has little place in Martin’s gritty, bitter world. They’re also not very bright. That said, the good guys are usually down at this point in a series. This is a standard rule that transcends genre. Remember how Apollo Creed won at the end of Rocky? -The cast of characters is unwieldy. It’s not a matter of having a slew of names to remember that boggles the reader, but the mess of identifying details Martin will use to identify someone in lieu of their name: their house, their lineage, their seal, or some physical aspect. For some reason, Martin believes it is essential for the reader to know the color of each character’s cloak. The glut of detail also slows the plot. I got a deal on the first four books, so even though I said I didn’t want to mess with the sequels until they’re all published…I feel like I should press on through the first four at least. But if Martin becomes another Robert Jordan and publishes one bloated tome after another with the next book always hyped to be the good one…I will post one heck of a rant. I’m not even going to put it in the So Bad I Read It For You section; I’ll just whine here. Do you know how long it would take to summarize all the backstabbing and intrigue of a book in this series? I don’t have that kind of time. Overall: 3.8 It’s entertaining enough. It’s good enough. If you have some time, go for it.